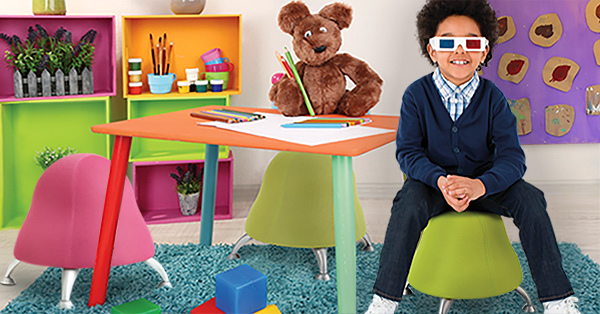 It’s no secret that U.S. schools are undergoing radical changes to classroom design. Changes range from the development of more mobile and interactive spaces to the introduction of different types of furniture to the inclusion of new technology. All of these changes have been designed to enhance the educational experience and improve learning outcomes. Seating has been of particular interest whether renovating an entire space or just experimenting with ways to better meet student needs. Talking with teachers at the SDE Conference in Las Vegas last summer they shared how they were excited to be introducing a few new seating options into their classrooms. Often these changes were approached on an individualized basis or for a specific area of the classroom and not necessarily employed for every student. I was particularly intrigued however, by Shauni Sawchuck from Henderson, NV and her approach to flexible seating. She has enthusiastically jumped in, completely eliminating the traditional desks and chairs in her space and creating a unique space for all of her students. Shauni has graciously agreed to share a series of three blog posts on her experience and the resulting outcomes over the next several months. Let me start out by saying this: Teaching is hard. Whether you are a first year teacher or a veteran, no matter your age, teaching is hard. In the past, students were told to go to school, sit, and behave. We were told to memorize the math facts just because, and were never taught how to take notes — we were just expected to do it. Little to none of our fellow peers were diagnosed with Dyslexia, ADD, ADHD and such; they were just those kids that had that special seat next to the teacher. What is most important to remember is that school was never different nor fun. 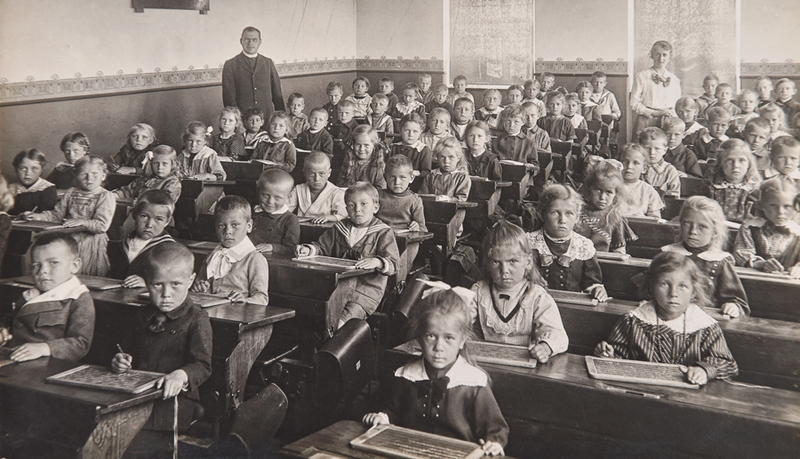 School was a chair and a desk in front of a blackboard and teachers taught to the whole class and not to the individual. Most of what we as adults knew as school has changed. There are more and more students diagnosed with learning disabilities and attention disabilities in the general classroom. Math facts are no longer memorized, but explained through background concepts to promote understanding of the “why” behind the fact. Students are given more resources and real life practice instead of just “notes,” and accommodations are made for individual students who learn differently from other students. However, with all of these positive and innovative changes made to education and classrooms, there are still a large majority of classrooms stuck in the past with traditional desks and chairs sitting in front of blackboards. It’s time to bring the classroom up to speed with the rest of educational reform with the integration of flexible seating. This is the idea behind flexible seating in the classroom. 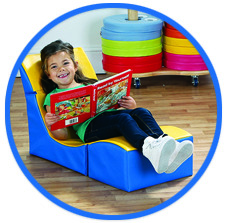 Students are given multiple seating options in order to promote comfortable seating choices to ensure academic success. How did I get started with this non-traditional classroom set-up? I teach four class periods of middle school English Language Arts with my largest class holding thirty-eight students. I was challenged with trying to fit almost forty desks and chairs into my classroom. I realized I needed a change in my classroom, and I wanted to be a revolutionary change for my own students. After getting rid of my desks it was quite easy to design my space the way I wanted it and the way it would work best for the kids; giving them multiple seating options for all types of learners. I was able to find different seating options to fit my space through both the school and department stores. I was able get other items donated to me. I also made a DonorsChoose project, and also had my students’ families fund me. It was easy to gather items when I put the word out to my parents and fellow staff members. People kept donating to me throughout the year and the new items would always come in to replace the worn out items. My classroom is currently the only classroom in my school that has “full flexible seating.” Flexible seating is not a “reward” system for good behavior, nor is it just for the wiggliest students, but for all students who enter my classroom. Teachers need to understand that it’s great to add little flexible elements here and there to get your feet wet, but if you are truly trying to make a difference in your classroom culture and with how your students learn, they need to take their toes out of the water and dive right in! Teaching is hard, but teaching is even harder when you do not teach with the changing times. Challenge yourself to start thinking outside of the box. Start a revolution in your school. Give your students the privilege to learn in a 21st century classroom rather than an outdated model. Flexible seating is made for everyone, and it comes in all shapes and sizes, therefore it can fit in any classroom. Be flexible! Find out more about flexible seating in Part 2 – The Process.